Welcome to Your August 2017 Newsletter! Judging by two articles sent into this month's newsletter, Senior College (SC) members are enjoying the Maine summer! USM's Lewiston-Auburn SC is providing some excellent adventures to their membership through their clubs. Meanwhile, the Gold LEAF Institute reports on a rather unusual approach to hiking. In other news, York County SC award a much-appreciated scholarship and celebrate their annual meeting with a talk from retired Maine game warden Roger Guay. I have the pleasure of meeting some Senior College Board members this month! Early in the month, I am traveling to Ellsworth to visit board members from Downeast SC. 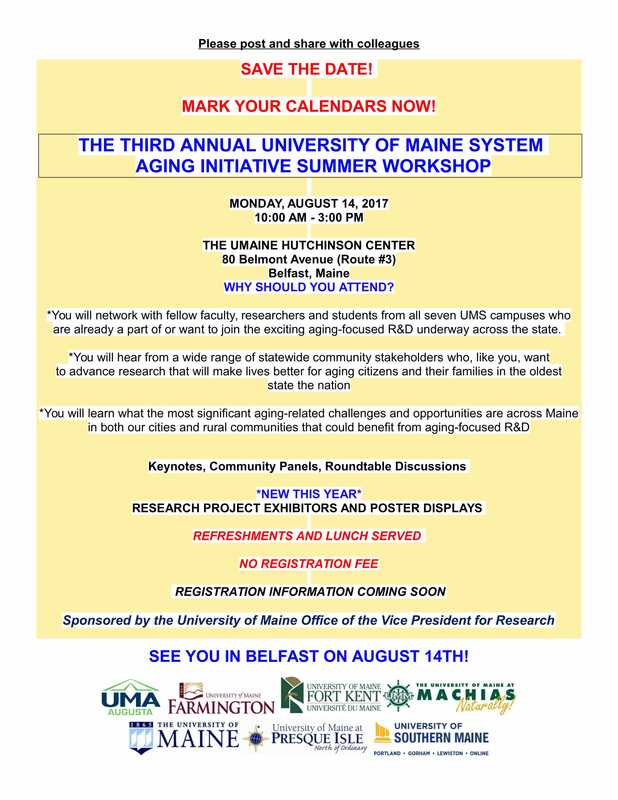 On August 14th I will be able to meet some Senior College at Belfast members when I attend the UMaine System's Aging Initiative at the Hutchinson Center. I have booked a table for the Maine Council on Aging's Wisdom Summit and look forward to seeing some of you at the summit in September. My thanks to the UMaine in Augusta SC members for agreeing to help me man the MSCN table! If your Senior College would like to have any flyers, catalogs or brochures displayed on the table, please let me know! The Maine Senior College Network has been invited to take part in a WGAN Radio "Maine Points" interview! I will be joined by Fleurette Bannon representing York County SC, Tony Belmont from Midcoast SC, and Janet Stebbins from OLLI at USM. My thanks to all three of you for helping me to spread the word about the Maine's Senior Colleges. At the time of writing, I do not know the date for transmission of the interview. However, you can visit the Maine Points podcast page for a recording once it has aired. Adam Lacher, Director of Advocacy for the Alzheimer's Association, Maine Chapter has contacted the MSCN office with information about a talk he is offering to deliver to your Senior College. See Discrediting Alzheimer's Myths And Common Misunderstandings for more information. Ashley Nadeau-Belanger is this year's recipient of the York County Senior College scholarship. The scholarship is given annually to a graduate of Sanford's Adult Education Program. Ashley is a Mental Health and Human Services major at the University of Maine at Augusta. A resident of Biddeford, Ashley plans to graduate in the spring of 2018. Pictured above (left to right) Dan Philbrick, Director of University College-Saco, Ashley Nadeau-Belanger, and Jane Carlson, Chairperson of York County Senior College. Picture of Theater Club with cast at the Monmouth Playhouse production of Oklahoma. at a nearby restaurant. The longest trip was to Boston, dining at Jacob Worth's then going to see Blue Man Group. Is just what its name implies, searching out interesting restaurants near and far. They have sampled food from restaurants small and large, near and far, both exotic cuisine and down home food. Have they ever met a cuisine they didn't like? Their latest adventure had them sampling Maine's favorite summer food: lobster! Rafting Trip at Northern Outdoors. Have something you really want to do, but no one you know wants to do it with you? Leaders Pat Vampatella and Cindy Boyd solve that problem with unusual adventures of all kinds. Winter includes a horse drawn sleigh ride through fields and woods. A December highlight is participating in the laying of wreaths at the Togus Veterans Cemetery as part of the wreaths across America program. This summer they took to the water. In June, they went to Northern Waters Raft Adventures for a trip through some white water. July wa s a trip to Scarborough Marsh, where we rented canoes and enjoyed a guided tour. In August they will join the Augusta Senior College group on a trip to Monhegan Island. Outdoor Adventure. Camping food - delicious after a day of adventures! Lost Valley Ski Area in Auburn has helped many learn to enjoy one of Maine's most famous sports. With cross country trails, too, it provides a convenient place for members to learn a new skill and experienced skiers to keep limber. Visiting the many fine places for cross country skiing here in Central Maine keeps club members on the go. Come the first skiable snow, they will be on the trails once again! Summer in Maine calls for hiking boots, bug spray, and a hearty breakfast. In a cleverly entitled series, Gold LEAF members are joining "presenter" Ray Stillman for hikes up area hills and mountains that begin with the letter B (or which can be mispronounced, such as Botato Hill, actually known as Potato Hill in Temple, Maine). The latter concept came up when the group was listing future hikes and ran out of "B" names. With no mispronunciation, Bannock Mountain was tackled as the first of such hikes, and the weather cooperated beautifully. A group of about 16 tromped uphill to enjoy the scenic vista of Clearwater Pond in Industry and a calm view of the hills to the northeast and northwest. On an absolutely clear day, one can spot Katahdin in the distance. According to a weathered sign at the top, Bannock takes its name from an early exploratory excursion during which the troop baked a "bannock" which is a type of flat bread there at the summit. There were etchings in the rocks to investigate, and, as a surprise, the Gold LEAF Curriculum chair and her husband arrived via a circuitous route with cookies and cold drinks. They own the start of a building at the top, and hikers were able to stand atop the foundation/first floor level to take in an enhanced view. After a rest and time for socializing, the group safely descended back down to Route 43 and the town of Industry. The next hike in the series will be up one of the gazillion Bald Mountains, no telling which one! The Marriott banquet hall was filled June 7 to celebrate the close of the 2016-17 college year, to select officers and council representatives for the coming year-and to hear a fascinating talk by an engaging retired public servant. Roger Guay, former Maine game warden turned author, regaled the audience of 119 YCSC members with stories romantic and routine of the great Maine woods. His duties involved searches for missing persons, homicide investigations, recovery of cadavers-and catching poachers. In each of these assignments Ranger Roger was accompanied by a faithful canine companion. Their exploits have been chronicled in the recently published book, A Good Man with a Dog, co-authored by Kate Clark Flora. While Roger and his dogs captivated the rapt audience, the meeting also served as an "inauguration" of YCSC's leadership for 2017-18. Jane Carlson will enjoy another term at the helm; Mary Blood will continue as treasurer and Gloria Day, secretary. Newly chosen for service on the Council: Bob Dunn and Pat Scammon. Gloria (Day, that is) has said she'll take on the chairmanship of the 2018 meeting. This article originally appeared in York County Senior College's Summer 2017 "Senior Moments"
You will network with fellow faculty, researchers and students from all seven UMS campuses who are already a part of or want to join the exciting aging focused R&D underway across the state. You will hear from a wide range of statewide community stakeholders who, like you, want to advance research that will make lives better for aging citizens and their families in the oldest state in the nation. You will learn what the most significant aging-related challenges and opportunities are across Maine in both our cities and rural communities that could benefit from aging-focused R&D. Download Flyer and Location information . Join hundreds of community, organizational, business, health, research and policy leaders at the 4th annual Maine Summit on Aging. The Wisdom Summit will focus on reframing the conversation about our aging demographic and older Mainers. It will challenge our ageist assumptions and help us understand how cultivating the intelligence, ingenuity and resiliency of older Mainers is moving us toward innovation, interconnectivity and economic prosperity. For the next two decades, older Mainers will be the thought leaders, workers, new small business owners, mentors and community development trailblazers that keep our economy working and our communities thriving. This Summit will help participants learn how to effectively change the conversation about aging in Maine and advance policies at every level to inspire a new vision of aging. Our Keynote presentation will be by Frameworks Institute. FrameWorks is an essential resource on framing social issues to promote effective policy change. FrameWorks has completed a multi-year project researching how we view aging and our changing demographic. They've released three reports that are helping to shift public communication and advocacy on these issues. At the Summit, participants will learn the most effective ways to talk about the opportunities and challenges of aging and our changing demographic, be inspired by organizations, initiatives and people who are putting these concepts into practice, and gain access to tools they can utilize to effect change in their lives, organizations and communities and on state and federal policy. FrameWorks will be hosting hands-on training sessions throughout the day that will help folks understand how to use the tools they've created and released this winter. Other work sessions will help us all understand the tremendous opportunities that come with our aging demographic. Dementia is a disease and not a normal process of aging. Knowing signs and symptoms of dementias and risk factors can lead to early detection. Early detection of cognitive decline and early intervention and planning helps individuals, families and caregivers significantly. "This disease is complex and emotional," said Adam Lacher, Director of Advocacy for the Alzheimer's Association, Maine Chapter. "Personally, I love to see those 'Ah ha' moments when an attendee gets a new idea or strategy to try to help their loved one living with the disease." To learn more about Alzheimer's disease and other related forms of dementia, please call our 24/7 Helpline at 1-800-272-3900 or visit us our website. "Act on Alzheimer's": Participants learn to dispel misinformation and overcome the stigma associated with Alzheimer's disease and related forms of dementia. Furthermore, participants will be introduced to the early warning signs, as well as ways to help reduce one's risk of developing the disease. This talk is designed to help folks take an active role in the fight to end Alzheimer's. Contact Adam by calling 207.772.0115 ext: 26 or send him an email. The 2017 Maine Woodcarver's Association's 31st Annual Show and Competition will be held at the Buker School Community Center in Augusta, Maine on September 23rd. Doors open at 9:00 AM. Admission $4.00 for adults, 14yrs. and under are free. FMI please visit the Maine Woodcarver's website. The 20th of each month!